A New York Times profile today makes it clear that Newt Gingrich plans to put his wife Callista front and center in his presidential campaign, despite the fact that having an affair with her while married to someone else sort of undercuts that whole social conservatism thing. But it doesn't answer the question, Why? It's clear that Newt is terribly devoted to the third Mrs. Gingrich. It's less clear why voters should be similarly entranced. 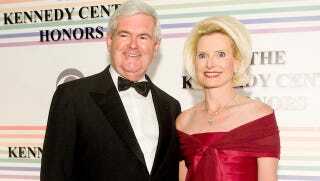 Barely a sentence goes by without Mr. Gingrich uttering the words "Callista and I." They are constantly together - at the National Catholic Prayer Breakfast in Washington, at conservative political conferences, at book signings and screenings of their documentary films. She is the voice on his audio books; her face is all over his 2012 Web site, where visitors can read "A Note from Newt & Callista." He converted to Catholicism for her. He goes to her concerts and choir performances. She returns the favor by giving her life over to the campaign. The closest we have to an explanation of Callista's political benefits is that "Mr. Gingrich is presenting himself as a family man who has embraced Catholicism and found God, with his wife as a kind of character witness. Depending on one's point of view, she is a reminder of his complicated past, or his secret political weapon." Or, if you take Gingrich's point of view, she's a Chevrolet.